← Macbeth: what happens next? When I put up my list of top ten Shakespeare speeches I promised a second set of speeches which I associate with a particular performance. My list provided a great subject for discussion during a long walk when my husband reminded me of some of the great actors I’ve missed out, including Michael Pennington, David Tennant, Tony Sher, Patrick Stewart, Harriet Walter, John Woodvine, Penny Downie, Ian McKellen. I’ve been lucky enough to see and hear many brilliant performances on stage – I might have to do a third list! If you want to read the whole speech there’s a link to the scene, taken from MIT’s online text. Only one is available to listen to online, but see the end for advice if you would like to listen to recordings of the performances. I mentioned this one in my earlier post. 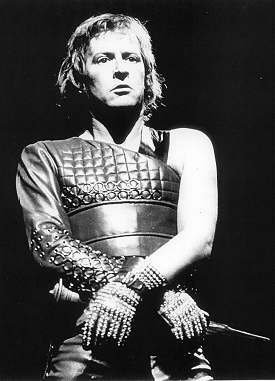 The speech is often performed out of context but Beale performed it stunningly as part of the play for the National Theatre. This is a studio recording of a different speech but gives a flavour of Beale’s performance. I vividly remember this speech from the 1980 RST production in which David Suchet played Bolingbroke. It is specifically about the pain of banishment, but speaks of any kind of separation or loss. Jane Lapotaire’s controlled anguish as the Queen was wonderful in the RSC’s 1996 Swan Theatre production. The speech is on The Essential Shakespeare live Encore 4. One of Shakespeare’s most famous speeches, quite rightly. John Carlisle has a wonderfully rich and poetic voice perfectly suited to this sumptuous speech, performed at the Royal Shakespeare Theatre in 1989. You common cry of curs! Alan Howard made this part his own, playing it for the RSC in Stratford, London and on European tour in 1977-78 before recording it for the BBC’s TV production. His performance is too big for the small screen, but it’s a good recording of this definitive performance. John Heffernan played the title role at Bristol’s Tobacco Factory in 2011. The intimate stage with the audience on all sides left the actor vulnerably alone on stage to deliver this final soliloquy. The actor, playing Prospero in 1982 used nothing but the power of his voice to dominate the huge space of the RST, starting quietly and building to a crescendo. On The Essential Shakespeare live. Juliet Stevenson’s wonderfully lyrical voice was perfect when she played Titania for the RSC in 1981. Judi Dench gave a perfectly judged performance as Adriana for the RSC in 1976. In this scene she was a figure of both comedy and tragedy as she spoke of losing the love of her husband. The scene on YouTube is from the TV recording – not the same speech but similar enough to give the idea. RSC performances from 1982 are available to view on video at the Shakespeare Centre Library and Archive, and the National Theatre’s Hamlet should be available at the National Theatre’s archives. Three recordings are on the RSC’s CDs The Essential Shakespeare live and The Essential Shakespeare live Encore, selections made from the recordings at the British Library’s Sound Archive, where they can be listened to. There are lots of great recordings on YouTube. I specially recommend the South Bank Special – Word of Mouth, a masterclass in speaking Shakespeare’s verse with John Barton, Trevor Nunn and Terry Hands. This entry was posted in Plays and Poems, Shakespeare on Stage and tagged Alan Howard, Anton Lesser, David Suchet, Derek Jacobi, Jane Lapotaire, John Carlisle, John Heffernan, Judi Dench, Juliet Stevenson, National Theatre, Royal Shakespeare Company, Shakespeare, Simon Russell Beale, sound recording, Tobacco Factory. Bookmark the permalink. Wow yes what a pleasure it is to see and hear Alan Howard again doing Coriolanus and that 1976 Trevor Nun production of Comedy of Errors. I think I went to see it at least half a dozen times. The 1970s under Trev were a real golden age for the R.S.C. I agree with all of your choices and well done for finding room for someone new, John Heffernan’s Richard II was brilliant. John Heffernan would be one of my choices too – it was a simply wonderful performance. And I loved Antony Sher doing “Ye elves of hills…” in the Baxter 2009 Tempest at the RSC. 1. Hamlet, Act 1 Scene 2 (RSC 2008 production). In Hamlet’s first appearance in the play, David Tennant displayed taut, controlled grief in front of Claudius, his mother and the court but then let go and sank to his knees to do “O that this too too solid flesh would melt…..” Heartbreaking. 2. Henry IV Part 2, Act 4 Scene 3 (RSC Histories Cycle 2007). “Thy wish was father, Harry, to that thought. I stay too long by thee, I weary thee ….” The bitter reaction of Clive Wood as Henry IV after Prince Harry has taken the crown thinking his father to be already dead. 3. Richard III, Act 1 Scene 1 (RSC Histories Cycle 2007). Jon Slinger’s mesmerising performance as Richard began with a venomous “Now is the winter of our discontent” during which he appeared to be cradling the infant prince Edward, following on from where he had held the baby at the end of Henry VI Part 3, but with a quick movement it became just a piece of cloth. Thanks for your comments Jo! It’s a fun game, isn’t it?